The 17th World Congress of Physical Therapy will be held in Singapore from 1st to 4th May 2015. As part of the build up to the congress we’re holding a tweet chat on Monday 30th March 8pm(BST) focused on using social media to join the international physical therapy conversation. This year’s congress is using some innovative social media initiatives including the congress Facebook group, conference # and WCPT twitter feed (see links below). The congress will also have a social media networking session and we hope that the wider twittersphere and Facebook community will get involved with and be a part of this, and that the use of this social media in the build up to and during #WCPT2015 will lead to the wider international community getting involved in the event. During the #WCPT2015 tweet chat we’re planning to explore ways the physical therapy community can use social media to share knowledge and experiences, and improve care for patients. In order to prepare for the chat it would be great if you could have a look through some of the questions below that we’ll be using to generate discussion. We hope that physiotherapists/physical therapists from all of the WCPT regions will get involved with the event in preparation for the congress in Singapore in May 2015. If you are a student, clinician, manager, researcher, academic, professional lead, business owner, or have a portfolio career we would love to have you involved. Have you used social media to see what other country’s organisations are doing? Do you converse with international colleagues and what are the benefits? Do you have any examples of international collaboration from social media? How can we continue to develop the international conversation? 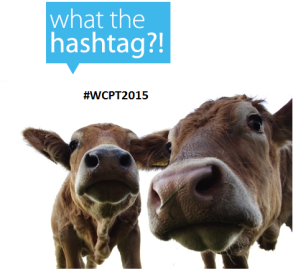 What sessions will you follow at #WCPT2015 ? Will you join the social media networking session via Twitter/Facebook? The chat will take place on Monday 30th March 8pm(BST) (please note:clocks go forward in the UK the night before!). See our information on time zones here. Gerard is a graduate of Trinity College Dublin and Physiotherapy Lecturer at Coventry University, UK where he lectures on the MSc Manual Therapy and BSc Programmes. He has organised and delivered post graduate CPD courses in the UK, Ireland and abroad while still maintaining a clinical caseload in his Physiotherapy Clinic in Birmingham, UK. He is a strong advocate of getting Physiotherapists involved with social media. Gerard is a member of the MACP Executive committee where he has the role of social media representative. He has established several successful Physiotherapy social media platforms on Twitter, Facebook and Linkedin. He has helped developed the social media strategy for the MACP whose platforms are now well established within the Physiotherapy and Healthcare online communities. Within the speciality of Women’s health he has established a very successful international women’s health forum on Facebook with Michelle Lyons which has over 2000 members. An abstract on the group submitted by Gerard, Marianne Ryan ( APTA) Sue Croft ( APA) & Michelle Lyons ( ISCP) has been accepted for a poster presentation by WCPT 2015. He has also set up some Physiotherapy graduate platforms on Social Media which have served as a template for other universities. He has delivered numerous presentations on engaging physios with social media in the UK, Ireland and abroad including a platform presentation with Dr Joe Mc Veigh at ICSP 2015 in Dublin. He has been invited by WCPT 2015 to deliver the social media networking session in Singapore.